There are two main pillars to European energy policy: the internal energy market (“IEM”) and the Climate Change Package. 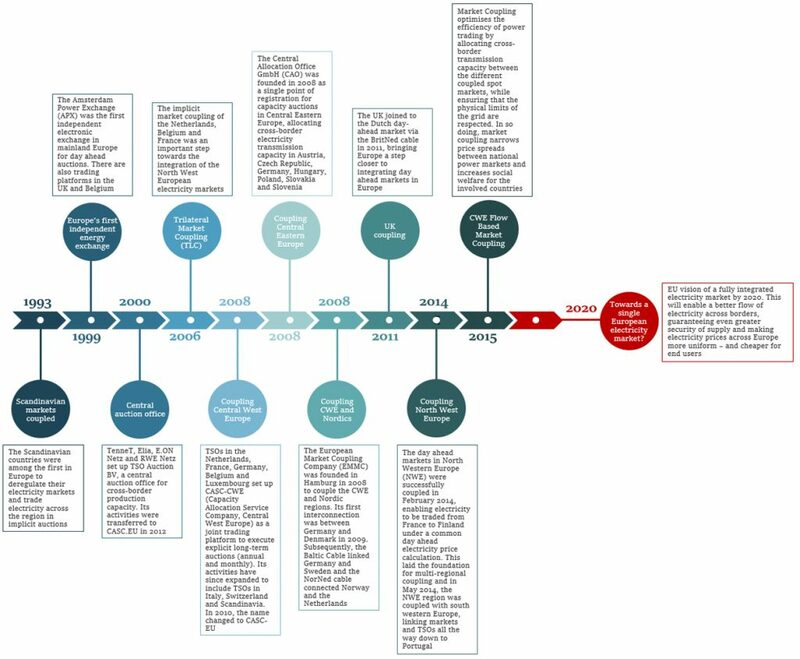 The IEM was the result of extending the Single Market into energy, and involved the unbundling of networks from generation and supply with regulated rather than negotiated access to those networks. The ultimate goal is the creation of a single pan-European energy market, connected through the implicit allocation of capacity on interconnectors between the electricity grids of neighbouring countries. 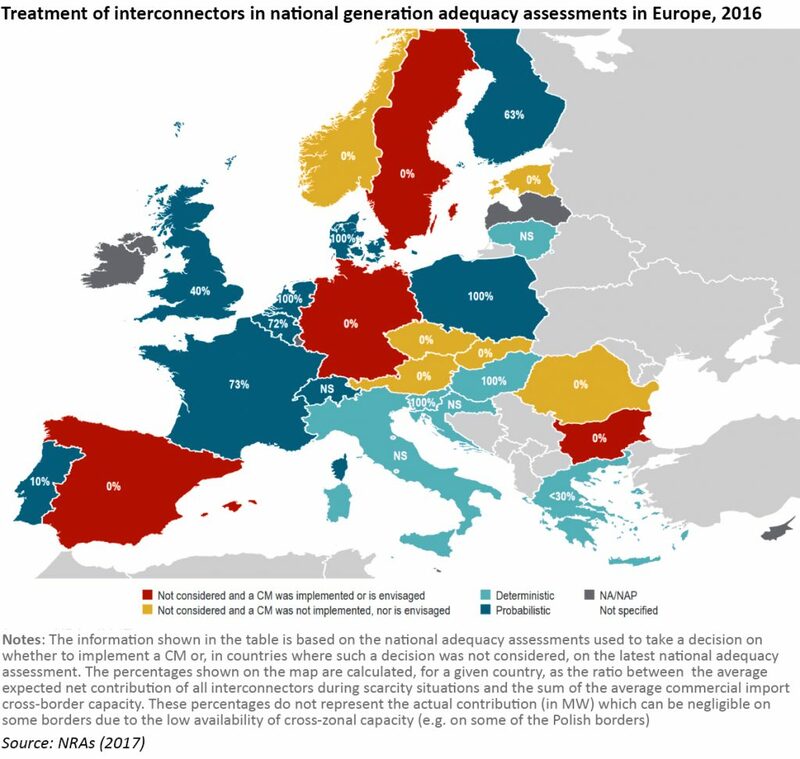 Prior to the introduction of market coupling, transmission capacity on Europe’s interconnectors was allocated through explicit auctions. There were inefficiencies with this approach, which was evidenced when electricity flowed from the higher-priced market to the lower-priced market, against the economic logic for interconnector use. Inefficient use of interconnectors raises costs for consumers across the EU as the costs are ultimately passed on through bill or taxes, which prompted regulators to develop market coupling as an alternative means of allocating transmission capacity. Under market coupling, long-term interconnector capacity continues to be allocated through explicit auctions where market participants trade electricity and transmission capacity separately. However, at the day-ahead level, implicit auctions were introduced – transmission system operators (“TSOs”) inform the power exchanges of the available capacity on their interconnectors (physical capability less capacity nominated by long-term capacity holders), and market participants place orders in their local markets, with a pan-European algorithm called “Euphemia” determining the amount of electricity that will flow along each interconnector in every hour of the day ahead. The algorithm is designed to maximise social welfare, by matching surplus supply in one market with excess demand in another, and allowing customers to access the cheapest sources of energy, while pooling risk, exploiting geographic diversity, and reducing the need for new generation capacity. Estimates by Booz & Co. suggest that the increase in social welfare of fully integrating Europe’s electricity markets could be between €16 and €43 billion per year by 2030. The latest step on the road to full market integration took place in May 2015, with the launch of flow-based market coupling (“FBMC”) for the day-ahead market in the Central West European (“CWE” region). However, the expected benefits of FBMC have not materialised, with interconnectors in the flow-coupled markets being significantly under-utilised. Analysis by the Agency for the Cooperation of Energy Regulators (“ACER”) shows that only about a third of the realistically available cross-border capacity is currently offered to the market in the core region (excluding the Central Western), which covers most of continental Europe. In some instances, the capacities offered are even lower – Germany limits imports from the Netherlands to 12% of available capacity, while the Netherlands allows 83% of capacity for flows in the opposite direction. According to the European Federation of Energy Traders (“EFET”), its member companies have observed TSOs restricting access to cross-border transmission capacity with increasing frequency, in order to manage internal congestion and/or to reduce their exposure to re-dispatch payments. This is consistent with ACER’s analysis, despite the fact that the practice of reducing allocated capacity at borders in order to avoid internal congestion measures and their related costs is prohibited under EU law. The Regulatory Assistance Project “RAP”) compares this with imposing a cap on cross-border trade in goods in order to protect the interests of a particular Member State — something that would not be tolerated in any other area of the European Single Market. Where bidding zones are large, there is a higher chance that transfers of electricity from one part of the zone to another will actually be routed through neighbouring countries, particularly where the zone suffers from internal capacity constraints as is the case in Germany. Since the start of FBMC in May 2015, loop flows on the Belgian network averaged 900 MW in the North-South direction, with day-ahead price spikes above €100 /MWh often coinciding with high loop flows. Loop flows also reduced Belgian import capacity increasing the need for strategic reserve capacity, all of which has to be funded by Belgian consumers. At the same time, German export capacity was partly consumed by loop flows, inhibiting the ability for excess German renewable generation to be exported, leading to low and even negative German wholesale prices. The existence of large bidding zones also contributes to locational uncertainty of generation. To cope with this, CWE TSOs introduced Flow Reliability Margins (“FRMs”) which lower commercial cross-border capacity, and have recently proposed increasing these margins on the ten most critical lines from 12% to 16% of thermal line capacity. In total, internal network constraints within bidding zones limited cross-border exchanges in 33% of all the hours examined in the study, with on average only 9% of the thermal line capacity being available for commercial cross-border exchanges. The average price spread during these congested hours was €18 /MWh, with wholesale prices being the highest in Belgium and/or France and the lowest in Germany. This spread, caused primarily by internal transmission congestion within Germany, has led to higher prices for French and Belgian consumers and to an unfair competitive advantage for German companies. Just after the go-live of the FBMC in May 2015, German TSO, Amprion, identified several lines as critical infrastructure, which had not been treated as such prior to the start of FBMC. These have been the most constraining network elements during the entire monitoring period, limiting cross-zonal exchanges in 25% of all considered hours. The inclusion of these additional network constraints caused an average increase of the Belgian, French and Dutch wholesale prices of €1.4 /MWh, €0.5 /MWh and €0.4 /MWh respectively between July 2015 and July 2016, and a reduction of in German prices of €0.4 /MWh. The study states that CWE TSOs and power exchanges have estimated that half of the potential welfare increase of FBMC compared with the previous market coupling methodology has been lost due to the addition of these constraints. Amprion also introduced FAVs of +300 MW on the four interconnectors between its control area and the Dutch market, reducing the interconnector capacity on this border by about 1200 MW. FAVs enable the Remaining Available Margin (“RAM”) on a critical branch of the network to be adjusted simulating the effect of remedial actions which are too complex to be taken into account explicitly. A negative value for FAV increases the RAM while a positive value reduces the available margin on a critical branch. Although FAVs are allowed to address exceptional situations, Amprion applied them for all hours over a period of 14 months, limiting cross-zonal exchanges in 10% of all hours. FBMC methodology allows TSOs to adapt thermal line capacity in line with changing weather conditions, and most TSOs adjust at least on a seasonal basis, leading to higher capacities during winter (when their economic value is expected to be the highest), with published switching dates. However, not all do this, for example, Amprion did not apply winter limits on its lines in the winter 2015 –2016, and in November 2016 summer limits were still in use. CWE TSO simulations for November 2016 show that cross-zonal volumes would have been 700 MW higher on average if Amprion had applied winter limits. This increase would have mainly benefited France, with a decrease in the French–German price spread of €3.5 /MWh on average. CWE TSOs introduced explicit import and export limitations to account for grid security factors that are not part of the FBMC calculations. During the monitoring period, all TSOs applied import limits, and German TSOs also imposed export limits which constrained flows in 8% of the monitored hours. Since FBMC go-live, RTE has removed all external import and export limits, and in the recent proposal from the “Core” TSOs for the Capacity Calculation Method, external constraints seem also to have been removed for Germany. The lack of transparency around network constraints under FBMC has been cited by market participants as one of the main reasons for distrusting the functioning of FBMC in particular, the anonymisation of the names of critical network elements has caused major concern since they cannot be linked with information on the planned network outages announced on the ENTSO-E platform. While some CWE TSOs had agreed to publish the physical names of the network constraints at the go-live of FBMC, it was only from 1 July 2017 that all CWE TSOs agreed to publish non-anonymised data on the JAO transparency platform. In a majority of hours, the amount of capacity available after taking into account constraints (known as the “flow-based domain”) was very small and sometimes even zero (the so-called “pre-congested case”). In Winter 2016 the flow-based domain was too small to accommodate long-term capacity nominations (“LTA-violation”) up to 70% of the time, meaning that TSOs had to increase the flow-based domain virtually, therefore the process was no longer “flow-based” but reverted to the previous method of a net transfer capacity (“NTC”) calculation. In these cases, the available capacity under FBMC was generally only a third of the old NTC-capacities for the Belgian borders. When people speak about threats to the IEM, Brexit is often the first thing that comes to mind, however, a bigger threat to the IEM can be found in changing approaches to energy policy by Member States who are effectively repatriating functions that could be part of the singe energy market. Although the European Commission has proposed solutions to the under-utilisation of interconnection capacity by requiring that redispatch and countertrading (ie adjusting generation schedules to manage internal congestion) should be used to maximise cross-border capacity, provided that it is economically beneficial to do so “at a Union level”, the European Council has proposed that any increase in interconnection capacity offered to the market should be gradual – following a linear progression, starting at the level of capacity offered at the point of enactment and rising to 75% of available capacity only after four years, or by 2025. At the same time, a number of Member States are implementing capacity mechanisms, with several assuming little or no contribution from interconnectors to their supply/demand balances – if interconnector capacity was included, those proposed capacity mechanisms may not even be needed, thereby avoiding capacity costs for consumers in those markets. Some Member States are forecasting capacity deficits in the years ahead, while others are forecasting surpluses, a situation which market coupling is designed to smooth out, reducing the overall need for investment in new capacity, and allowing supply reliability to be maintained at a lower cost than if each country tries to be independently self-sufficient. However, security of supply is a matter for individual Member States, embedding a conflict between the objectives of the IEM and the responsibility of each country to try deliver reliable supplies to its own consumers at an appropriate cost. One solution would be for countries like Belgium that are being adversely affected by loop flows to use Phase Shifting Transformers (“PSTs”) – of which Belgium has four, located close to the Dutch border – to “push back” loop flows. PSTs control the phase angle across the transformer – since power flow through the transformer depends upon phase angle, this allows the transformer to regulate power flows. Analysis published by Elia in November 2016, suggested that this would simply move the problem to other parts of the CWE bidding zone. A more constructive solution to these problems could be the splitting of larger bidding zones into smaller ones – something TSOs are generally reluctant to do, although the splitting of the Swedish bidding zone in 2009 provides an interesting precedent. In 2009, Denmark brought an anti-trust case against Sweden before the European Commission because the Swedish TSO, Svenska Kraftnät (“SvK”) had been curtailing interconnector capacity due to internal congestion problems between the production centres in the north of the country and consumption centres in the south. 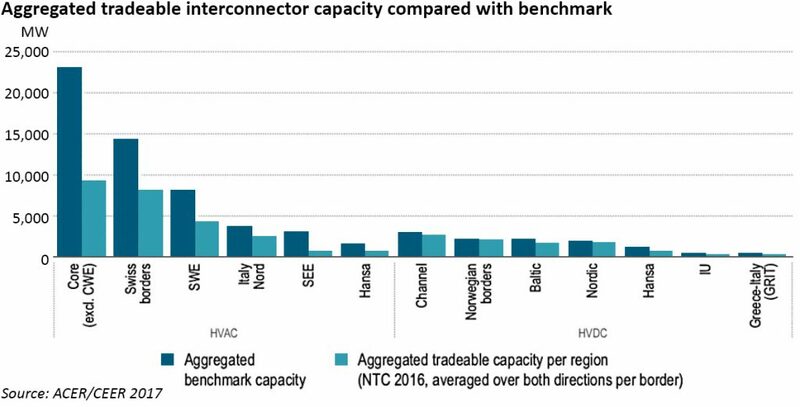 By curtailing interconnector capacity, SvK limited the ability of Denmark to receive imports from Norway, which partly transit through Sweden. The Commission deemed these actions to be anti-competitive because they limited international trade, and Sweden was forced to split its market into smaller bidding zones. This case triggered an on-going discussion in Europe on the optimal size of bidding zones. In the US, some states have reduced the size of their bidding zones to the size of nodes on the transmission grid, which is known as nodal pricing. In April, the European Network of Transmission System Operators for Electricity (“ENTSO-E”) published the first edition of the Bidding Zone Review – analysis aimed at determining whether the European bidding zones should be re-configured. The analysis suggests that split configurations are better and merged configurations inferior when it comes to operational security. Reducing the size of bidding zones increases market participants’ exposure to grid constraints, since trading with neighbouring zones means competing with each other for access to scarce grid resources. Market participants are not permitted to dispatch generation or demand units if these are beyond grid limits, decreasing the need for corrective actions by TSO thereby increasing operational security. However, in relation to market liquidity and competitiveness, merged configurations appear to be superior since unconstrained trade is possible across a larger geographical area, increasing the ability of market participants to find trading counterparties. Overall, no clear benefits could be identified from changing the existing bidding zone configurations, leading the TSOs to recommend maintaining the status quo. The CREG believes a pan-European solution to enforcing the proper functioning of the IEM would be more efficient than unilateral measures by individual markets, such as the use of PSTs, and favours the creation of sufficiently small bidding zones or even a nodal design to allow full utilisation of transmission network capacities. It also believes that “technical zone splitting”, where there is a single national price zone for consumers alongside several bidding zones for producers would be feasible. In particular, it has identified the need to split the German bidding zone, something that is being strongly resisted by German policy-makers. The costs of remedial actions should be shared based on the “polluter-pays” principle, where unscheduled flows along overloaded network elements should be treated as “polluters” who contribute to the costs in proportion to their contribution to the overload. As the primary purpose of a capacity allocation procedure is to ensure cross-zonal exchanges do not create overloading of the network, cross-zonal exchanges should not be considered to cause congestion or be deemed “polluters”. Any deviation from these general principles should only be temporarily applied when it is: (a) needed to ensure operational security; and (b) economically more efficient than other available remedies (taking into account the EU-wide welfare effects of the reduction of cross-zonal capacity) and minimises the negative impacts on the internal market in electricity. It seems very unlikely that there will be a further splitting of the German bidding zone in the near future, (beyond the split with Austria which is due to take place in October this year) despite the views of numerous market participants that the structure of the German market is undermining the functioning of the Internal Energy Market. Despite the failures of FBMC at the day-ahead level, the project continues to roll forwards, with XBID, the project to create a single pan European cross zonal intraday market in Europe, progressing – the first phase, continuous trading, is due to go-live in the first ten countries in June 2018. In the meantime, consumers across Europe will continue to suffer significant economic losses due to the flawed design of flow-based day-ahead market coupling, and the ethos of the Internal Energy Market remains under threat. I recall the German/Dutch interconnection capacity was heavily bid by certain counterparties some years ago. That left them in effective control of the capacity, and allowed them to build trading positions either side of the border that became very profitable when the capacity was not used yet supply was constrained. Similar trading could also be seen on the BritNed connector – and indeed the Zeebrugge and BBL gas lines.